Place your order now thru SATURDAY 4/13/19 at 6pm. Please note — If the item you ordered is sold out, you will be refunded the amount you paid. We cannot control the grower’s shipment to us. If they do not ship your order, you will receive a refund not a replacement. Refunds are issued in cash only. We are not offering grapes this season; only wine juice. We expect to receive our shipment in mid May. We will contact you as soon as the shipment arrives at A&M. Thank you for your business. Cheers! 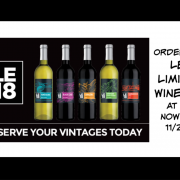 Pre-Order Your LE18 Wine Kits Today! Each year Winexpert does not disappoint with their Limited Edition Kits…and this year is no exception! 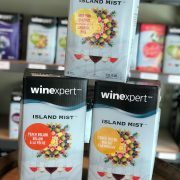 Check out these classic varietals and truly unique blends. BLACK CAB – Lodi, California: The vibrant acidity and smooth tannin in this dry red Cabernet and Gamay Noir blend are accentuated by flavors of cherries, red berries, spices, and soft vanilla notes. FUME BLANC – Hawke’s Bay, New Zealand: Note how the tropical fruit and melon flavors pair with the grassy notes and light oak in this dry, oaked Sauvignon Blanc white wine. CORAZON – Curicó Valley, Chile: Full of deep fruit flavor, this blend of Carmenere, Cabernet Franc, Syrah and Pais delivers a well balanced dry red wine — medium to full body, juicy fruit flavor, smooth tannin with just the right amount of oak. Symphony Gewurztraminer – Sierra Foothills, California: A unique blend – aromatic, floral, fruity with just a hint of sweetness. This crisp and bright off-dry white wine is full of peach, apple and tropical fruit flavors. Barbaresco – Piedmont, Italy: The Barbaresco Style dry red wine–made with the Nebbiolo grape–is widely regarded as one of Italy’s top wines. The addition of grape skins make this wine bold, spicy and lucious, with strong tannins and a long finish. These limited release wine kits must be pre-ordered by Wednesday, 11/28 @ 6pm. A 50% down payment is required on all orders. The kits will arrive @ A&M in 2019. To order, visit A&M to pay with cash, check or credit card, or call 724-222-WINE & pay with a credit card. Special – Order 2 or more kits and receive $5 off each kit. Order 3 or more kits and receive $10 off each kit. Thank you for choosing A&M for your winemaking needs! https://amwinesupplies.com/wp-content/uploads/2018/10/LE18-orders-2.png 711 1200 AngeJohn /wp-content/uploads/2016/01/am2.png AngeJohn2018-10-30 11:47:442018-10-30 11:48:50Pre-Order Your LE18 Wine Kits Today! For this season, we are pleased to offer California red wine and white wine grape juice. All orders must be paid in full on the date of the order. Place your order now thru Wednesday 9/26/18 at 6pm. Please note — If the item you ordered is sold out, you will be refunded the amount you paid. We cannot control the grower’s shipment to us. If they do not ship your order, you will receive a refund not a replacement. Refunds are issued in cash only. We are not offering grapes this season; only California wine juice. We expect to receive our shipment in mid to late October. We will contact you when the shipment arrives at A&M. 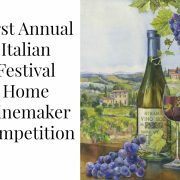 WINEMAKERS – Enter your homemade wine into our 2nd Annual Italian Festival Home Winemaker Competiton. To enter the competition, bring one bottle of wine and $5 entry fee to A&M Wine & Beer Supplies, then complete a form. That’s it! Each winemaker may enter up to 4 different wines. Entries will be accepted during business hours until Thursday 9/27/18 at 6pm. A&M’s hours are: Wednesday & Thursday 11-6, Friday & Saturday 11-7. Join us at the Washington Italian Festival, Saturday 9/29/18, 1-3pm. Winemakers are not required to attend the festival to win, however, we would love to see you there! Saluti! 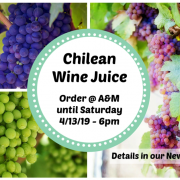 We have just received our order information for this spring’s Chilean Wine Juice & Grapes. 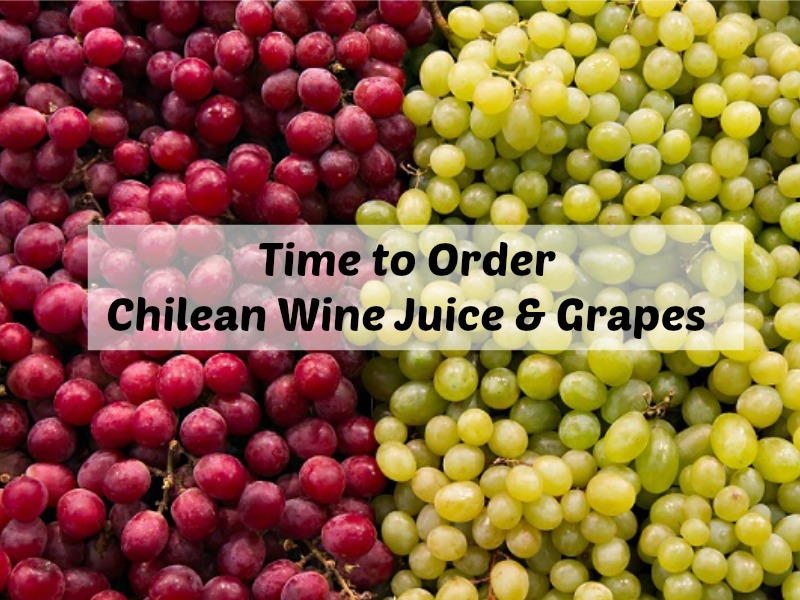 Our order forms for Chilean Wine Juice and Wine Grapes are now availale. *Orders must be placed by Saturday, 4/21/18, 6pm. The juice will arrive in MID to LATE MAY. We do not have a specific delivery date and cannot guarantee the arrival of these fresh items on or by a specific date. Once the shipment arrives at A&M, we will contact you. *All wine juice and wine grape orders must be paid in full on the date of your order. All orders & payments will be made directly to A&M either in our store via cash, check or credit card, or over the phone via credit card. *If the item you ordered becomes unavailable, you will be refunded the amount paid. The refund will be in either cash or store credit. *Once notified that your order is in, please pickup your order within 5 business days. If you have questions or need information, please call us at 724.222.WINE or email us at amwinesupply@gmail.com. Thank you for choosing A&M for your winemaking needs. Cheers! Now available…sweet wine kits. These summer flavors are ready in only 4 weeks, and sound delicious. Even better…these kits are on sale through 4/28/18! See store for details and sales price. 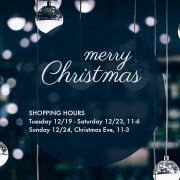 We will be CLOSED for 4 days: Christmas Day (12/25), Tuesday 12/26, Wednesday 12/27 and Thursday 12/28. We will be CLOSED for 2 days: New Year’s Day (1/1) and Tuesday 1/2. We wish you and your family a very Merry Christmas and a wonderful 2018! Cheers! Pre-Order Your LE17 Wine Kits Today! Petit Ruby Cabernet from Australia – Dry Red, Medium-Full Body & Oak, Releasing January 2018. This intriguing blend of Petit Verdot & Ruby Cabernet combines the best of both parent grapes. This structured robust wine has soft tannins and flavors of dark fruits, berries and vanilla. $148. To learn more about Petit Ruby Cabernet, click here. Chardonnay Chenin Blanc from South Africa – Dry White, Light-Medium Body & Oak, Releasing January 2018. Combine the buttery complexity of Chardonnay with South Africa’s signature Chenin Blanc grape that is a little tart & acidic. The resulting wine is balanced, crisp & bright with tropical fruit aromas with hints of apples & peaches. $143. To learn more about Chardonnay Chenin Blanc, click here. Merlot from New Zealand – Dry Red, Medium Body & Oak, Releasing February 2018. New Zealand is well known for producing some of the best of this popular varietal. The ripe fruit, spice and soft tannins take precedence in this Merlot. A lingering finish reveals dark oak & spice. $148. To learn more about Merlot, click here. Milagro Blanco from Spain – Off-dry White, Medium Body, Unoaked, Releasing March 2018. The fruity crispness of Muscat, the mineral & citrus notes of Verdejo and the pleasing acidity of Sauvignon Blanc merge in harmony to create a soft, refreshing fruit-forward wine with a bright finish. $143. To learn more about Milagro Blanco, click here. Negroamaro from Italy – Dry Red, Full Body & Oak, Releasing April 2018. This single varietal wine is a classic grape from Apulia, Italy. The complex aroma leads to fruity notes with mild hints of wood & spice. The ripe berry flavors are enhanced by the silky tannins and long finish. This kit includes the grape skins. $170. To learn more about Negroamaro, click here. 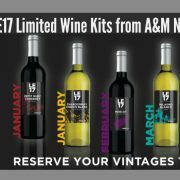 Ordering information: These limited release wine kits must be pre-ordered by Saturday 12/2 @ 6pm. The kits will arrive @ A&M in 2018. A 50% down payment is required on all orders. **SPECIAL DEAL** – Purchase 3 or more LE17 Kits and receive a bag of 100-count corks of your choice. https://amwinesupplies.com/wp-content/uploads/2017/10/LE17.jpg 624 1640 AngeJohn /wp-content/uploads/2016/01/am2.png AngeJohn2017-10-09 15:42:022017-10-09 15:55:30Pre-Order Your LE17 Wine Kits Today! 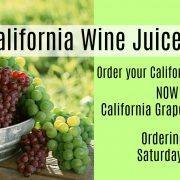 We have the list of California wine juice available for order. Order extended to Saturday 9/23/17 @ 6pm. The delivery is expected to arrive AFTER 9/26/17. Please note: We do not have a specific delivery date and cannot guarantee the arrival of these fresh items on any specific date. All orders must be paid in full on the date of the order. If the item you ordered becomes unavailable, you will be refunded the amount paid in either cash or store credit. Once notified that your order is in, please pickup your order within 5 business days. 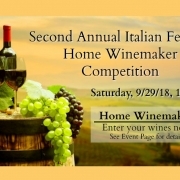 A&M is thrilled to sponsor the Home Winemaker Competition during the Washington Italian Festival! Put your best wine forward and join the fun! You may enter wine made from wine kits, grapes, juice, fruit–any type of wine will be accepted. The judging for this competition will be held at the Washington Italian Festival on Saturday 9/23/17 between 1-3pm. Winners will be announced at 3pm. Festival attendees will be able to sample wine from one of the categories and vote for their favorite. Winemakers will receive two votes. Sampling will be limited to one category per person 21+. How to enter: Bring the completed form (link below), your wine, and your $5 entry fee to A&M by Thursday 9/21/17. Forms are also available at A&M. Join the fun @ the Italian Festival & vote for your favorite homemade wine! We would be happy to ship an order to you! Please call 724-222-WINE or email amwinesupply@gmail.com to have products shipped directly TO YOU! Some restrictions apply. Please contact us for details. Cheers!